With the completion of this review my count of remaining C&C brand sodas reaches two! I’m not excited to be done with C&C because they’re awful or anything, they taste just fine thank you. My excitement stems from getting back into a variety of soda types and flavors. Believe my I’m gracious for the 24 sodas sent my way thanks to C&C, but our time together is ending and that’s ok too. What am I reviewing? While I’m happy you asked that with this paragraph soon coming to an end. Today’s bottle of sugary bubble water is C&C Pineapple. Unfortunately, pineapple soda all tastes rather average to me as I’ve yet to be completely blown away by one. Who knows, maybe today will be the review that changes all that. A healthy, but somewhat chemically enhance odor bursts from the bottle’s mouth. While it’s not an exact replica of pineapple juice the aroma was close enough for me to not give up hope on this being a delicious rendition of pineapple soda. Now it’s time to find out if my day will end in disappointment ore exuberance. Well I’m not disappointed nor am I exuberated. Fun fact, I typed exuberated expecting it to be a word I just made up… imagine my surprise when I did not find the squiggly red line of misspell parked underneath it. Speaking of surprise, the only aspect of C&C Pineapple soda that garners such a reaction is how mediciney (there’s my red squiggle friend) it tastes. Yes, there’s no mistaking that the flavor of pineapple is every present, but it is become less enjoyable with each sip. With my first sip I was greeted with a fairly nice pineapple soda. For every following sip the medicine pineapple taste begins to build on itself creating a somewhat unpleasant tasting curtain of syrup in my mouth. The carbonation level could be higher as I feel a sharper bite might help mask this doctor prescribed flavor. It’s odd that I gave points to the amoxicillin flavored C&C Topical Fruit Punch, yet I take away from C&C Pineapple because it tastes like a medicine I have no fond memories of. Ah well, thems the breaks. 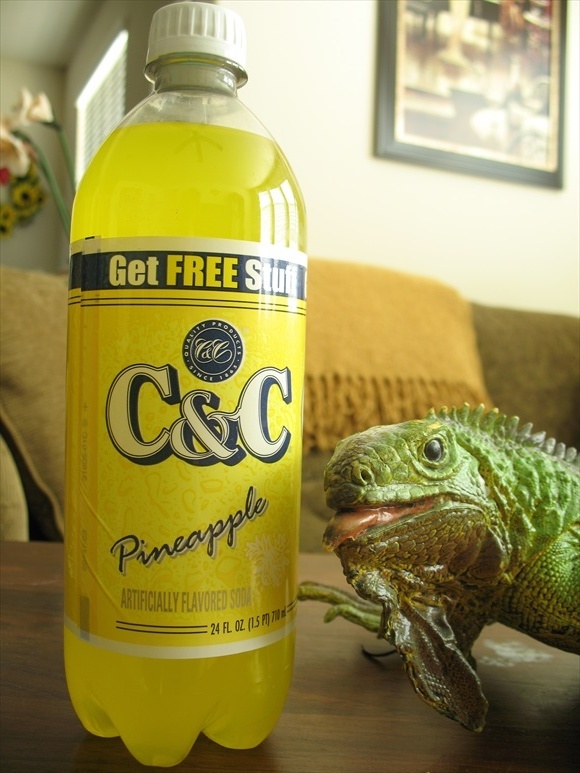 C&C Pineapple isn’t a great soda, heck I wouldn’t even call it good, but I’ve consumed worse things. With that said though, I just can’t recommend you buy it. Twist suggested a cottage cheese soda to accompany. I politely refused.